Fragile labels allow your company to cut down on loss. Fragile shipping labels instruct the package handler to treat the package with care. These shipping labels come in a variety of sizes and messages to make sure your package remains undamaged throughout the shipping process. 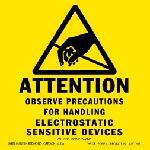 There is a variety of fragile shipping labels available from Boatman Marking. Glass labels ensure that your package is handled with care. These shipping labels make handlers aware that there are breakable items in the package to be shipped. Glass shipping labels cut down on loss by ensuring that your package is undamaged during shipping. At Boatman Marking you will find a variety of glass shipping labels. 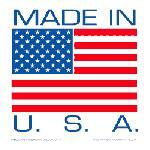 Flag labels let your customers know that your product was made in the USA. Products being manufactured in the US are becoming more popular and using Made in USA labels on your packages will give your customers comfort and satisfaction at knowing that they are buying a US product. We offer a variety of sizes of flag labels at Boatman Marking. Miscellaneous labels include certain labels which may be obscure, but important none the less. Our miscellaneous labels category contains hot and cold labels, antistatic labels, as well as a variety of other miscellaneous shipping labels.